We can supply for hire a full range of camera including specialist mini cams, DSLR's and event covert cameras. Please browse our selection and contact us for further information or hire details. 4K25. 4x the resolution of 1080p. 4K25, 2.7K50, 1080p120—HERO4 Black is the first camera of its kind to feature ultra high-resolution, high frame rate video as powerful as this. 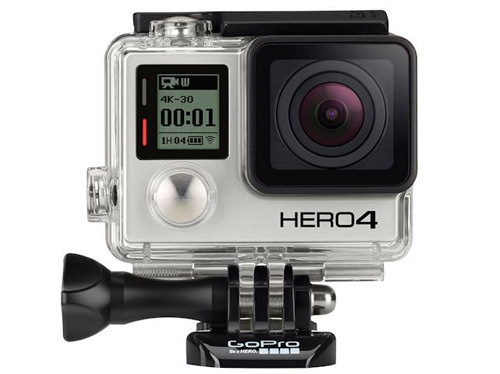 Once the exclusive domain of large, costly cameras, HERO4 Black delivers truly professional video quality in a tiny package. Stunning clarity. Liquid-smooth slow-motion playback. Cinema-quality capture. HERO4 Black brings it all. Medium FOV is not available for 1080p120 and 1080p90. Ultra Wide is not available for 60 fps. The chart below indicates the approximate continuous recording time (hr:min) you can expect when shooting in various video modes using a fully charged battery. Based on GoPro engineering testing. Actual performance may vary based on settings, environmental conditions and other factors. Maximum battery capacity will normally decrease with time and use.